'Leccy Tech Fans of the hydrogen fuel-cell powered Honda FC Sport sci-fi style concept car may have a reason to rejoice: Honda president Takeo Fukui reckons plug-in electric cars are hopeless. In an interview to Chinese-language website auto.163.com, he said that electric vehicles are still "immature", the main problem being the batteries. Mind you, he also thinks that current electric cars can only achieve a 100km (62 mile) range which must come as news to Tesla owners and suggests he might not be fully up to speed on the subject. 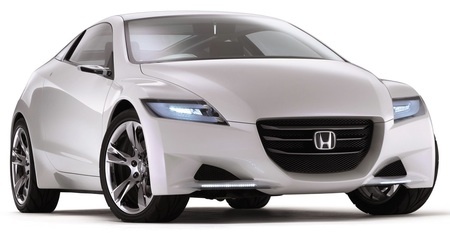 Either way, Honda clearly sees the future as belonging to hydrogen fuel-cell and petrol-electric hybrid propulsion. Fukui reckons that by 2018, hydrogen fuel-cells will be a mass-market technology. In the meantime, we'll have to do with the Prius-bashing Insight that Honda showed at the recent Los Angeles Motor Show and the rather sportier CR-Z that was unveiled as a concept at the 2007 Tokyo Motor Show. Both cars share a number of components and rely on good old-fashioned nickel metal hydride batteries, Honda apparently not being at all convinced about the reliability or safety of lithium-ion jobs. The headline numbers? CO2 emissions of around 80g/km and fuel economy in excess of 80mpg. Following the Insight to market? The Insight will go on sale in the US first in the spring of 2009 at a price Honda say will be significantly below that of current hybrid cars. That should mean a price in the UK of around £15,000. Honda hopes to shift 200,000 Insights each year, half of them going to the US. No news on a release date for the CR-Z, but since both models will be coming off the same production line at the expanded hybrid vehicle production facility at Honda's Suzuka, Japan factory, the gap between the two shouldn't be too long.